The Bald Cypress adapts well to the states in the South West. 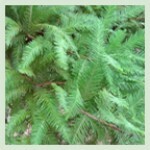 Foliage is medium green, soft textured, and ferny. It produces a very attractive fall foliage which is a dark rust-red. The Bald Cypress tree has the ability to live 100 years and is excellent in wet soil conditions.